Early in the book we are introduced to Luftwaffe Obersleutnant Keller, the German ace in command of the secret base at Rechlin. Flying for the Nationalist forces under Franco during the Spanish Civil War in 1936 - 1939, Keller’s Messerschmitt would have been painted in markings similar to the aircraft shown in this photo. Is this the real thing? Well, kind of…It is actually a Spanish-built version of the ‘109 called a HA-1112 that the Spanish air forces operated into the 1960’s. By most accounts, it was a horrible airplane. The most remarkable departure from Willy Messerschmitt’s original design is that the HA-1112 was powered by…of all things…a Rolls-Royce Merlin. 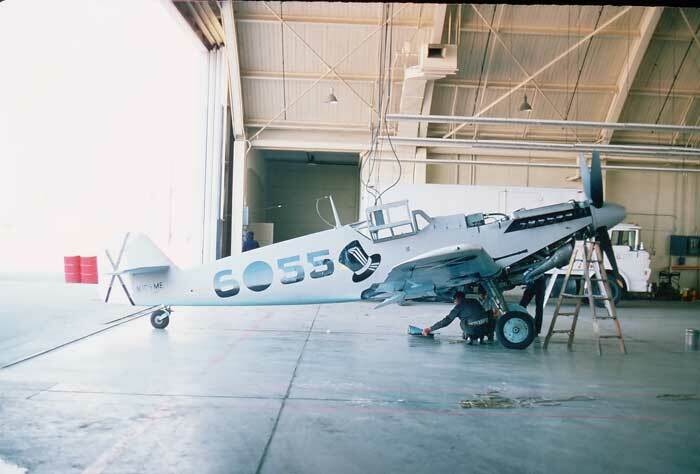 This example was obtained from the Spanish in the late 1960’s, used in the filming of Battle of Britain, purchased by American interests, brought to the U.S. and photographed as seen here, by the author (that would be me) in 1974 at the Camarillo airport during the filming of Hindenburg. It was used in the beginning of the film for one scene in which George C. Scott, playing a Luftwaffe officer, arrives back in Germany after duty in Spain. Like a ‘109 could really fly that far!